Monkies Review: LEGO NEXO KNIGHTS Axl's Tower Carrier + GIVEAWAY! 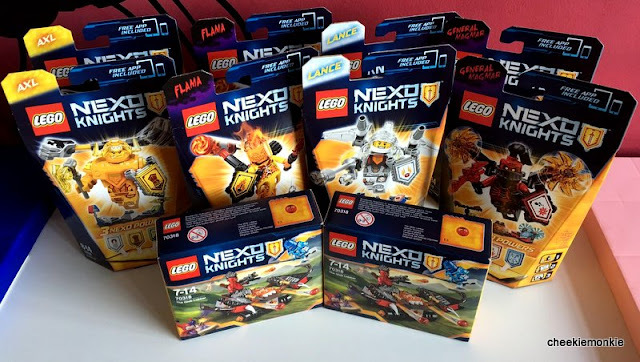 The second wave of the LEGO NEXO KNIGHTS is upon us and if the first wave is of an indication of how much the boys loved the series, it is safe to say the new Axl’s Tower Carrier set they received had them scrambling to open the box as soon as they saw it. The knights are armed with medieval weapons and armour, but each of their crest contain special powers. Each of the vehicle in the series are a cross between medieval and futuristic designs, which combines LEGO Castle, LEGO Space, and a good dose of imagination and magic. And much like the previous LEGO NEXO KNIGHTS set the boys received earlier, I decide to let them take over the reins on the blog and let them craft a blog post once again. After all, there is nothing quite relaxing like outsourcing! Both Ash and Ayd were responsible for every single thing in the post below; the typing of the text, the snapping, editing and uploading of the photos, and layout of the post. Hope you will enjoy their review! Oh, and do read until the very end because they have a surprise for you too! HELLO EVERYONE! We are back and this time, we have a new LEGO NEXO KNIGHTS set to review. The set is called Axl's Tower Carrier and our little sister insisted on helping us fix up the set. But because we want to build the main set on our own, we let her build the mini figurines instead. Hahaha! I think she is still very happy anyway. The set comes with two Axlbots, an Ash Attacker and of course, Axl. But the figurine that we love is Burnzie, a huge fire monster who has a giant flaming hammer. He is so much bigger than the usual mini figurine! What is cool about him is one of his hands is actually a disc launcher, which can shoot discs! But our favourite has to be the actual Tower Carrier, which is a combination of 2 vehicles! Our Dad says this vehicle reminds him of an aircraft carrier which is a large moving vessel that carries aircraft. In this case, the 'aircraft' is Axl's tower. Axl's tower can be detached from the main vehicle and can rotate while rolling on its wheels. One side of the tower is a disc shooter and the other side has two spring loaded projectiles. The main vehicle has six wheels and looks like a huge tank. When the tower is detached, the hollow space in the middle allows the catapult to be used. VERY COOL! Just like the Fortrex we built the last time, we love the design of the Tower Carrier too. How does LEGO come up with all these wonderful vehicle designs? And as you can see, we could not resist putting together a LEGO NEXO KNIGHTS story with our 2 sets. And our sister also could not resist joining in too. Well, as long as she does not bring her LEGO Friends into the story! LOL. Thanks to LEGO Singapore, we have TWO sets of LEGO NEXO KNIGHTS Sets to give away! Congratulations! You have each won a LEGO NEXO KNIGHTS set which consists of Axl, Lance, Flama, General Magma and the Clob Lobber. Please email me at kelvin@cheekiemonkie.net by 15 Sep 2016 for prize collection details. Thanks! Giveaway ends on 31 August 2016, 2359 hours. To my kids, Lego is everything they can build up to their wildest imagination. From cars to robot to castles to house. They love Lego! My boy is a 100% Lego fan & absolutely loves Axl! He even managed to influence my daughter who now loves Nexo Knights more than Lego Friends! They love to come up with their own characters & battle each other! We once witnessed Axl fighting with a half-Lance, half-Mia! Liked & shared. Thank you for the giveaway! My boys love Lego and play with it everyday. And everyday I see something new being created. The possibilities are endless! My 8 year old twin boys simply love Lego. (Actually Mummy & Daddy are Lego fans too!). My boys love to assemble Lego sets as well as discover and appreciate the amazing features incorporated in the sets. They would discuss about how the pieces work together to create movements and functions. My boys also love to assemble their own creations and set various scenes for the mini figures to act out. Lego allows my boys to use their creativity and imagination to play and learn. My boys love it that with Lego, the possibilities are limitless! My 2kids love Lego as it is colourful and creative for them to utilise fully on their creativity and imagination to build their own vehicles or models they love. Also allows them to train their motor skills and social skills to interact together. Thanks for blessing the Lego Nexo Knights set. My boy and girl loves and are huge fans of lego. Playing lego is our great way of making memories together as a family . My boy especially loves the exquisite features of each lego set and how he could mix and reassemble the lego according to his imagination. They have not own any Lego Nexo Knights so receiving this will be a great activity for us during the coming September School break. Thanks once a again😉. My 3+yo girl started playing LEGO at the age of 6months (playing Lego Duolo) and still loving them. She combines her Duplo, Friends sets, Creative Classic to create her imaginary places or objects or transportation. She can spend hours playing with them, and still never get tired of it. Bath time, bed time story, she must have her creation with her. I admire her passion for Lego. She has been asking for a Nexo Knights set for her 4th birthday (soon), hopefully her birthday wish comes true! My kids love lego as they use their creativity and imagination to create houses, vehicles, etc. Great for motor and creativity skills. My sons loves Lego so much he carries in his bag a Lego car or some creative vehicle which he builds everytime we go out! Recently he told me about Nexo Knights and has been asking me to buy for him. This contest came in time! Hope for a win! Thank you! My younger son loves Lego so much that whenever he has a set with him, he can spend his time analyzing and able to quickly fix it. Fo complex lego, it can take him days to do it. It gives him a sense of accomplishment and boost his self-confidence. This is what I felt the goodness with kids playing lego. I will always limit the set as it can be extremely expensive hobby. I hope to win this to encourage his creativity, self confidence and also patience. Thanks. Ny boy loves Lego very much as he can create his own toys for imaginative play. He can also role play with his favorite marvel characters such as Batman..superman..Ironman & etc. Poor mummy will have to buy the lastest lego sets for him whenever its newly launch. Recently, hes crazy over nexo knights & love to collect them all! So i do hope i can win some nexo knights for his collection ! THANK you for the giveaway! I loved LEGO as a child and now my boys love it too. It encourages them to work with their hands, development of logical thinking and spatial awareness. With a bit of imagination and creativity, they can build anything they want. My son is very interested with building things. When I bought his 1st lego set he was so happy and been making lots of things with it. lego Nexo will be good addition for his lego collection. Thank you cheekiemonkies. I hope to win this for my eldest son Bryan as he loved Lego Nexo Knights series. He had his Merloks's Library that have the Smasher and heroic knights. Building this makes him have a sense of accomplishment and being a knight while playing with it. He loves being hero. :) I always think that playing lego is a way of building his creativity and self caonfidence. So hope to win this for him. Thank you! Hoping to win this for my 9yr old who has a penchant for left since young. It never fails to impress me how he could do it without looking at the instruction books. Even with the difficult ones, it never fails to impress me the patience he undertook for each set though it might take a few days but he never gives up. This is something that I as a father has learnt. My boys who are very creative, will try to create what they seen or come across with their lego. My elder boy once came up with a sugarcane juice grinder with his lego blocks which he saw at the hawker centre! Children at young age can be very creative with lego! Both my kids love lego. They feel accomplished as they can complete the task of building using the clear precise instructions. After that, they can admire their work and play with them, creating fictatious senerios and recording the stories/adventures in video. The best part is the mummy will not breathe down their neck when they play with lego, at least not as often compared to them holding handphones. My 3 kids love playing Lego and this wonderful toy is just like a staple to them. They love the toys, cartoons and Legoland. My gal loves Lego because it is fun! We love LEGO, my son love Lego too. He fell in love with Nexo knight when it was first launched. He love sharing with his friends what he like too. One day, he came home and told me in a very sad tone that : no one like Nexo Knight in class except me. Hearing that did make me heart breaking. Despite that, he still wanted a Nexo Knight birthday at school. Given Nexo Knights was new then, finding one Nexo Knights cake is not easy. At the end, we ordered a jelly Lego cake and place three Nexo Ultimates Lego on top. We also printed out Nexo Knights party set from Lego.com. It was a great celebration and every kids in the class gathered around the cake and talked about Nexo Knights. Really hope we can get this extra set for him as his next birthday gifts! i would love to gift my daughter, bec she loves lego but gets princesses stuff instead. Lego is highly approved toys for my boys. Lego toys are brilliant! The beauty of Lego is there are options for all age group. 1. Develop Creativity: Lego can help stimulate child's creativity, which is something that will benefit them for a lifetime. They build using the step-by-step instruction the first time but then they would take it apart and do their own things. 2. Ability to Follow Directions: My younger boy is very active. I have hard time to make him focus. So I decided to give Lego a try and pull out a box of Lego City. Through my guidance, he is able to focus and follow step-by-step instruction to complete a set. It is really awesome! 3. Promotes Motor Skills: When the small hands learn how to assemble and take apart, these small twists and turns of their fingers and hands promote coordination and dexterity which children need for handwriting and craft. They both say Lego is fun & nice! My elder boy says it is satisfying to build something and characters are great (almost all characters are smiling:)) and for my younger boy, he is fans of Nexo Knights now and even can tell the names of each character and who is "good" & "bad" guys. Lego is always my #1 perfect toys ever. Thank you LEGO! We love Lego! As they are a wonderful toys for all!